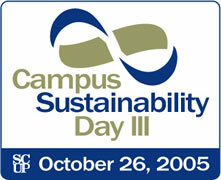 Campus Sustainability Day was conceived of in April 2002 as a national day of celebration. From 2003-2010, The Society for College and University Planning (SCUP) led the production of an annual anchor webcast to incite conversation and analysis of the campus sustainability movement. The webcast was co-produced and live streamed with The New York Times Knowledge Network from 2008-2010. Individual campus programs, events, teach-ins, and other conversations complemented this webcast across the nation each year. 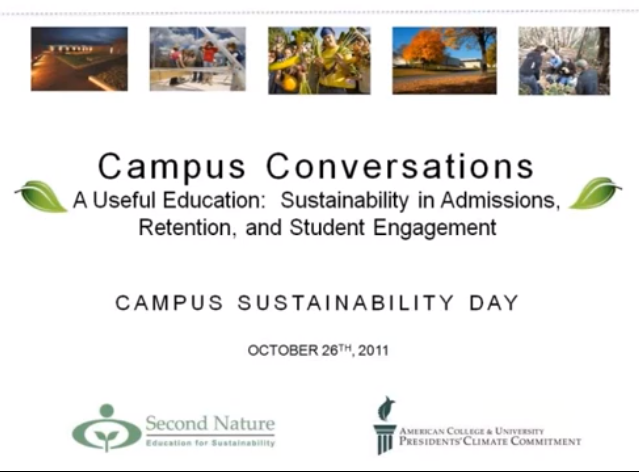 In 2011, a team of organizations and partners came together to more broadly engage the higher education community in the CSD program through the creation of a website for sharing events and conversations hosted by the Association for the Advancement of Sustainability in Higher Education (AASHE), and continuing an expanded anchor webcast hosted by Second Nature. Learn more about the current supporting organizations. Campus Sustainability Day 2013 focused on the theme “Climate Adaptation: Resilient Campuses and Communities”. Second Nature hosted a Keynote Broadcast discussing the role of campuses in adapting to a changing climate, innovations in climate resilience and mitigation, and advancing community partnerships and opportunities. The keynote broadcast attracted more than 300 institutions from 17 countries. 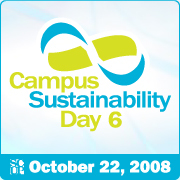 In addition, 151 institutions posted their events in celebration of Campus Sustainability Day, triple the number from 2011 (and at least 20 more institutions held events). CSD 2012 also had an active social media presence, with its own Facebook page and Twitter hashtag (#campusday). This Storify page captures the photos and stories from CSD 2012. The anchor program was an interactive Campus Conversation hosted by Second Nature. The webcast portion, entitled “A Useful Education: Sustainability in Admissions, Retention, and Educational Value,” highlighted the role of sustainability in shaping current and prospective student visions for their college experience. The webcast focused on the experiences and insights of several campuses, while the subsequent Q&A portion included an all-day dialogue with questions and video responses from students, admissions officers, college administrators, and faculty and staff from campuses across North America. At least 50 campuses celebrated CSD 2011 with more than 75 events. The anchor program was a streamed live video program titled: “Empowering A Climate Change Movement: Strategies and Tools for Behavior Change, Community Engagement and Large-Scale Transformation,” with guest speaker David Gershon, author of Social Change 2.0: A Blueprint for Reinventing Our World, and Low Carbon Diet: A 30 Day Program to Lose 5,000 Pounds. SCUP co-produced the program with The New York Times Knowledge Network, and the moderator was Andrew Revkin, former science editor for The New York Times. Students submitted questions via YouTube, which were addressed live during the program. The anchor program was a streamed live video program titled “Sustainability Strategies for Vibrant Campus Communities.” A panel explored how institutions could find opportunities in the wake of budget cuts and provide the appropriate campus infrastructure and knowledge to finance, plan, operate, and manage low-carbon, energy-efficient campuses. SCUP co-produced the program with The New York Times Knowledge Network, and the moderator was Andrew Revkin, science editor for The New York Times. The anchor program was a streamed live video program titled “Climate Realities, Challenges, and Progress in Higher Education,” which featured a panel including Richard H. Moss Vice President and Managing Director for Climate Change, World Wildlife Fund, and a member of the 2007 Nobel Prize-winning Intergovernmental Panel on Climate Change (IPCC) team. SCUP co-produced the program with The New York Times Knowledge Network, and the moderator was Andrew Revkin, science editor for The New York Times. “Building a Durable Future: Community, the Campus, and Deep Economy” addressed the role of colleges and universities within their local and regional economies. Learn how to use your economic power to create sustainable, local prosperity. The presenter was William McKibben, author of DEEP ECONOMY: The Wealth of Communities and the Durable Future, and other books. 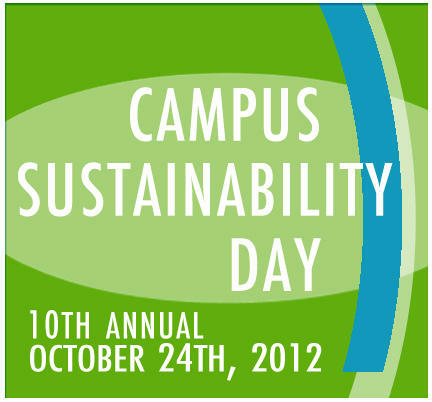 Campus Sustainability Day became an institutionalized, anticipated fall event on college and university campuses. The supporting webcast, “Where Is Your Campus On the Continuum of Integrated Sustainability Planning?” featured updates on the campus-based sustainability work of four institutions: Arizona State University, Grand Valley State University, Harvard University, and Pima Community College. \CSD webcast, “A (recycled, of course) Six-Pack of Sustainability Lessons from the Past Year in Higher Education,” featured a panel moderated by Joe Palca, science reporter for National Public Radio (NPR). The main CSD event was a SCUP audiocast on October 28, titled, “2004 Report to the Academy: The State of Sustainability on Campus.” SCUP also broadcast a webcast, “Sustainable Building and Design on Campus: Building A Restorative Educational Environment” earlier the same month. The first CSD held with a supporting SCUP satellite telecast, “Got Sustainability? Plan for it! Making Sustainability a Foundation of Higher Education Learning and Practice.” The contributions of Anthony D. Cortese, president of Second Nature, were key in the conception and development of the first Campus Sustainability Day.